The Department is administered by the Secretary of the Treasury, who is a member of the Cabinet. Senior advisor to the Secretary is the Treasurer of the United States. Signatures of both officials appear on all Federal Reserve notes. The first Secretary of the Treasury was Alexander Hamilton, sworn into office on September 11, 1789. Hamilton was appointed by President George Washington on the recommendation of Robert Morris, Washington's first choice for the position, who had declined the appointment. Hamilton established—almost singlehandedly—the nation's early financial system and for several years was a major presence in Washington's administration. His portrait appears on the obverse of the ten-dollar bill, while the Treasury Department building is depicted on the reverse. The current Secretary of the Treasury is Steven Mnuchin, who was confirmed by the United States Senate on February 13, 2017. Jovita Carranza, appointed on April 28, 2017, is the incumbent treasurer. On July 29, 1775, the Second Continental Congress assigned the responsibility for the administration of the revolutionary government's finances to joint Continental treasurers George Clymer and Michael Hillegas. The Congress stipulated that each of the colonies contribute to the Continental government's funds. To ensure proper and efficient handling of the growing national debt in the face of weak economic and political ties between the colonies, the Congress, on February 17, 1776, designated a committee of five to superintend the Treasury, settle accounts, and report periodically to the Congress. 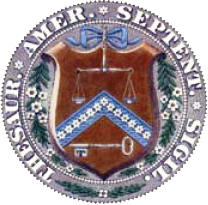 On April 1, a Treasury Office of Accounts, consisting of an Auditor General and clerks, was established to facilitate the settlement of claims and to keep the public accounts for the government of the United Colonies. With the signing of the Declaration of Independence on July 4, 1776, the newborn republic as a sovereign nation was able to secure loans from abroad. Despite the infusion of foreign and domestic loans, the united colonies were unable to establish a well-organized agency for financial administration. Michael Hillegas was first called Treasurer of the United States on May 14, 1777. The Treasury Office was reorganized three times between 1778 and 1781. The $241.5 million in paper Continental bills devalued rapidly. By May 1781, the dollar collapsed at a rate of from 500 to 1000 to 1 against hard currency. Protests against the worthless money swept the colonies, giving rise to the expression "not worth a Continental". Robert Morris was designated Superintendent of Finance in 1781 and restored stability to the nation's finances. Morris, a wealthy colonial merchant, was nicknamed "the Financier" because of his reputation for procuring funds or goods on a moment's notice. His staff included a comptroller, a treasurer, a register, and auditors, who managed the country's finances through 1784, when Morris resigned because of ill health. The treasury board, consisting of three commissioners, continued to oversee the finances of the confederation of former colonies until September 1789. Be it enacted by the Senate and House of Representatives of the United States of America in Congress assembled, That there shall be a Department of Treasury, in which shall be the following officers, namely: a Secretary of the Treasury, to be deemed head of the department; a Comptroller, an Auditor, a Treasurer, a Register, and an Assistant to the Secretary of the Treasury, which assistant shall be appointed by the said Secretary. From 1830 until 1901, responsibility for overseeing weights and measures was carried out by the Office of Standard Weights and Measures under the auspices of the Treasury Department. After 1901, responsibility was assigned to the agency that subsequently became known as the National Institute of Standards and Technology. The Department of the Treasury is organized into two major components: the Departmental offices and the operating bureaus. The Departmental Offices are primarily responsible for the formulation of policy and management of the Department as a whole, while the operating bureaus carry out the specific operations assigned to the Department. The Alcohol and Tobacco Tax and Trade Bureau (TTB) The Alcohol and Tobacco Tax and Trade Bureau (TTB) is responsible for enforcing and administering laws covering the production, use, and distribution of alcohol and tobacco products. TTB also collects excise taxes for firearms and ammunition. The Bureau of Engraving & Printing (BEP) The Bureau of Engraving & Printing (BEP) designs and manufactures U.S. currency, securities, and other official certificates and awards. The Bureau of the Fiscal Service The Bureau of the Fiscal Service was formed from the consolidation of the Financial Management Service and the Bureau of the Public Debt. Its mission is to promote the financial integrity and operational efficiency of the U.S. government through exceptional accounting, financing, collections, payments, and shared services. The Community Development Financial Institution (CDFI) Fund The Community Development Financial Institution (CDFI) Fund was created to expand the availability of credit, investment capital, and financial services in distressed urban and rural communities. The Financial Crimes Enforcement Network (FinCEN) The Financial Crimes Enforcement Network (FinCEN) supports law enforcement investigative efforts and fosters interagency and global cooperation against domestic and international financial crimes. It also provides U.S. policy makers with strategic analyses of domestic and worldwide trends and patterns. The Inspector General The Inspector General conducts independent audits, investigations and reviews to help the Treasury Department accomplish its mission; improve its programs and operations; promote economy, efficiency and effectiveness; and prevent and detect fraud and abuse. The Treasury Inspector General for Tax Administration (TIGTA) The Treasury Inspector General for Tax Administration (TIGTA) provides leadership and coordination and recommends policy for activities designed to promote economy, efficiency, and effectiveness in the administration of the internal revenue laws. TIGTA also recommends policies to prevent and detect fraud and abuse in the programs and operations of the IRS and related entities. The Internal Revenue Service The Internal Revenue Service (IRS) is the largest of Treasury's bureaus. It is responsible for determining, assessing, and collecting internal revenue in the United States. The Office of the Comptroller of the Currency (OCC) The Office of the Comptroller of the Currency (OCC) charters, regulates, and supervises national banks to ensure a safe, sound, and competitive banking system that supports the citizens, communities, and economy of the United States. The U.S. Mint The U.S. Mint designs and manufactures domestic, bullion and foreign coins as well as commemorative medals and other numismatic items. The Mint also distributes U.S. coins to the Federal Reserve banks as well as maintains physical custody and protection of the nation's silver and gold assets. In the latest Center for Effective Government analysis of the fifteen federal agencies that receive the most Freedom of Information Act FOIA requests, published in 2015 (using 2012 and 2013 data, the most recent years available), the Treasury failed to earn a satisfactory overall grade. ^ Donald A. Torres (1985). Handbook of Federal Police and Investigative Agencies. Greenwood Publishing Group. p. 275. ISBN 0313245789. ^ "An Act to Establish the Treasury Department". September 2, 1789. Retrieved 2018-10-11. ^ "The Treasurer". U.S. Department of the Treasury. Retrieved 6 May 2018. ^ Crutsinger, Martin (15 November 2017). "New money: Mnuchin and Carranza signatures now on the dollar bill". USA Today. Gannett Satellite Information Network, LLC. The Associated Press. Retrieved 6 May 2018. ^ "Appointment as Secretary of the Treasury". ^ Adams, Jonathan. "Department of the Treasury". George Washington Digital Encyclopedia. Mount Vernon Ladies' Association. Retrieved 6 May 2018. ^ Scanlan, Laura Wolff (2006). "Alexander Hamilton: the man who modernized money". Humanities: The Magazine of the National Endowment for the Humanities. 27 (1). Retrieved 6 May 2018. ^ "$10". U.S. Currency Education Program. Retrieved 6 May 2018. ^ Rappeport, Alan (13 February 2017). "Steven Mnuchin is confirmed as Treasury Secretary". The New York Times (Page A19). The New York Times Company. Retrieved 6 May 2018. ^ "Jovita Carranza: Treasurer, U.S. Department of the Treasury". U.S. Department of the Treasury. Retrieved 6 May 2018. ^ "Chapter 12, 1 Statue. 65" (PDF). ^ Records of the National Institute of Standards and Technology (NIST), National Archives website, (Record Group 167), 1830–1987. ^ Treasury Order 101-05, U.S. Dept. of the Treasury. 10 January 2011. Updated 26 April 2011. Accessed 11 November 2012. ^ DF Org Chart, "The Office of Domestic Finance". U.S. Dept. of the Treasury. October 2011. Accessed 11 November 2012. ^ International Affairs, "About International Affairs". U.S. Dept. of the Treasury. 14 February 2012. Accessed 11 November 2012. ^ "Environment and Energy". www.treasury.gov. Retrieved 2017-10-30. ^ Terrorism and Financial Intelligence, "About Terrorism and Financial Intelligence". U.S. Dept. of the Treasury. July 2, 2012. Accessed November 11, 2012.